Florida Gulf Coast players Eddie Murray (No. 23) and Chase Fieler (No. 20) celebrate their win Sunday over San Diego State. The game was played at the Wells Fargo Center in Philadelphia. -- How about those Eagles? Florida Gulf Coast knocked off Georgetown on Friday. That was a shocker because the Eagles came into the men's tournament as a No. 15 regional seed and Georgetown was a No. 2 (and had been picked by many to make the Final Four and possibly win the whole thing). Well, FGCU's Cinderella run continues. After beating San Diego State 81-71 on Sunday night, the team is now the first No. 15 seed to have won two games in a tournament. Not bad for a school that, as NPR's Mike Pesca said on Morning Edition, is younger than its players (FGCU opened in 1997). 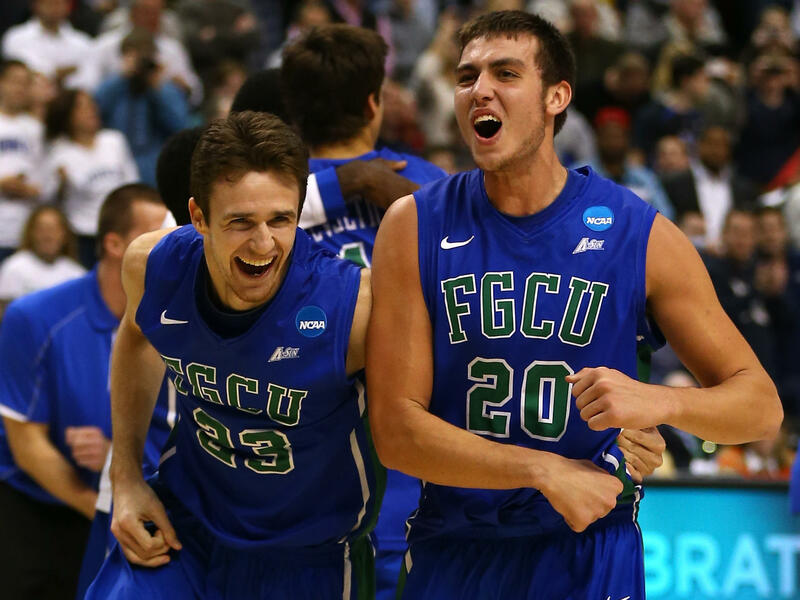 As Mike added, FGCU is playing with exuberance. Next up for the team CBS says is the biggest story going in sports: A Friday night game against the University of Florida (the No. 3 seed in the tournament's South region). That game will be on TBS, which is sharing the "Sweet 16" broadcasting duties with CBS. -- Craft's heel. Ohio State's Aaron Craft sent Iowa State home Sunday when he sank a three-point shot just before the final buzzer. The Buckeyes beat the Cyclones 78-75. You also need to know about the controversial call near the end of that game involving Craft's heel. "[But] if Craft's heel was still moving, then he wasn't properly set. That means it was a block and Clyburn should have been awarded the basket, plus one free throw. Second, a defender standing over the restricted area is considered to be in the restricted area." So, there's a good case to be made that the call should have gone the other way — and that Iowa State might have been able to hang on for the win. -- Dayton and St. John's played on and on and on. As The Associated Press writes, "The opening round of the women's NCAA tournament went true to form. Stars Brittney Griner and Elena Delle Donne shined. The top seeds cruised. There was a thriller or two, just not too many upsets." "[Dayton] had led by 13 points with 5 minutes, 20 seconds remaining, and by eight with just 1:35 on the clock. In fact, at various points throughout the afternoon, Dayton looked to be one bucket away from turning this thing into a blowout. "Then everything changed. The Red Storm went into a full-court press. St. John's freshman guard Ashley Perez, who did not even play in the first half, caught fire, scoring 17 points in 21 minutes, which included all of both overtimes. And senior guard Nadirah McKenith (22 points, 10 assists, 9 rebounds) made an amazing play at the end of regulation, driving the full length of the court and scoring off the glass, the ball dropping through the rim essentially at the buzzer. "The Red Storm seemed to have all the momentum and energy, but here's how you knew Dayton would win this one: When the Flyers walked back onto the court before the start of the first overtime, they were smiling. Not maniacal grins, but genuine smiles — as if they were absorbing and enjoying the moment." The women's tournament continues Monday night. Its games are being broadcast on ESPN2 and ESPN pay-per-view.